(Washington, D.C. â€“ March 24, 2009) The United States Environmental Protection Agency has sent two letters to the U.S. Army Corps of Engineers expressing serious concerns about the need to reduce the potential harmful impacts on water quality caused by certain types of coal mining practices, such as mountaintop mining. The letters specifically addressed two new surface coal mining operations in West Virginia and Kentucky. EPA also intends to review other requests for mining permits. 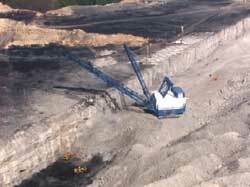 EPAâ€™s letters, sent to the Corps office in Huntington, W.Va., stated that the coal mines would likely cause water quality problems in streams below the mines, would cause significant degradation to streams buried by mining activities, and that proposed steps to offset these impacts are inadequate. EPA has recommended specific actions be taken to further avoid and reduce these harmful impacts and to improve mitigation. The letters were sent to the Corps by EPA senior officials in the agencyâ€™s Atlanta and Philadelphia offices. Permit applications for such projects are required by the Clean Water Act. A very positive development. I’m particularly happy to see the EPA use the phrase “the CUMULATIVE impacts on the watershed, forest and habitat destruction and fragmentation within a globally significant and biologically diverse forest system, and the impairment of downstream water quality” [my emphasis]. There will be cries that EPA is stopping MTR and killing jobs. No doubt there would be significant economic impacts if MTR is curtailed. (In my view, likely overcome in the medium or long term by economic benefits.) But it’s important to remember that MTR/VF is practiced because it is a cheaper way to surface mine for the coal companies–not the only way to mine. A case in point in Alaska: A controversial open pit gold mine in the Tongas got permits for the placement of mining spoil on wetlands. After the Bush changed regulations that allowed mining spoil to be declared “fill” (regulations changed, of course, with Appalachian valley fills in mind), the gold mine pursued new permits to dump their overburden in a lake below the mine. They did this because it was cheaper–even as the price of gold has skyrocketed–not because it was necessary. They got their new permits, but then the 9th Circuit said no–it’s a violation of the Clean Water Act. Now it’s going to be decided by the Supreme Court this spring. It seems like it’s a case with lot of consequences for MTR in Appalachia. I’m surprised to never see it mentioned here. The economy of our great state is in the hands of someone who simply does not care. I work in the coal industry, and am ashamed of people who call this state home that fight against what is the lifeblood of our economy. Coal is what puts food on my families table and thousands of other people in this state. I would be willing to wager that the majority of people who complain about MTR have not been to a site that has been reclaimed. I am deeply concerned for my families future and the thousands of other families who depend on coal to provide their livlihoods. I just hope our industry can survive the next four years when we will get an opportunity to send the “Sheriff” back to Illinois. Deep mining, GET READY your next on the enviros list. My heart goes out to individual families threatened by this decision; but this is much bigger than any of us as individuals. It’s well past time to look and act forward for the well-being of God’s earth, and for the future of our children’s children.